Marina Del Rey's boat-parade tradition started in 1963 when local boat owners created a parade to attract people to the waterfront community. 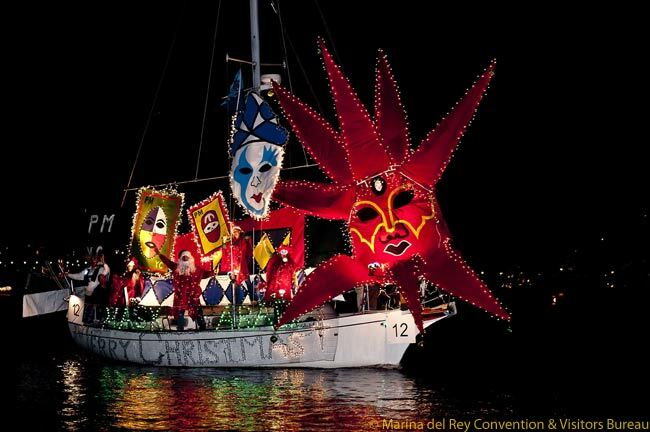 The annual Marina Del Rey Holiday Boat Parade is celebrating its golden anniversary this year. Marina Del Rey’s boat-parade tradition started in 1963 when local boat owners created a parade to attract people to the waterfront community. Five decades later, the Marina del Rey Holiday Boat Parade – this year called “Celebrating 50 Years, A Solid Gold Christmas” – is still a celebrated tradition and is poised to attract thousands to view the festively decorated boats competing for awards. Organized by an all-volunteer committee of local business and community leaders, the Marina del Rey Holiday Boat Parade will take place on Saturday, December 8 from 6:00 p.m. to 8:00 p.m. and will kick off with a fireworks show. Spectators are invited to enjoy the festivities from popular viewing locations such as Burton Chace Park, Fisherman’s Village and local hotels and restaurants. The route circles the Marina Channel past Fisherman’s Village, Burton Chace Park and the California Yacht Club. Parade judges will be stationed at Burton Chace Park where guests can hear live music and commentary from Lisa Osborn, KFWB-AM newscaster and Mickey Laszlo, a cartoon voiceover actor and KABC-TV traffic reporter. To add to the festivities, the Marina del Rey Convention and Visitors Bureau is distributing Santa hats with flashing LED lights to the first 1,500 spectators at Burton Chace Park. For more information about Marina del Rey, visit www.visitmarinadelrey.com. To find hotel deals in Marina del Rey, click here. To search for low fares, visit here.